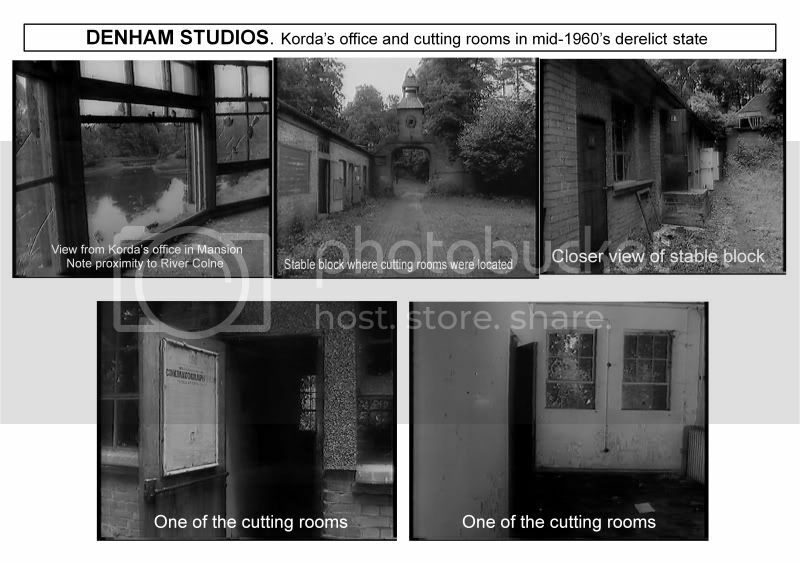 These pictures from Mr Smith’s collection show a visit in 1977 to Denham Film Studios just before the demolition began. The photographs show Herbert Smith who had run Denham from 1945 to 1950 and been a very influential person in the Film World throughout his life. Herbert Smith had been previously working at Beaconsfield Studios for some time when in 1945 he accepted an offer from Two Cities Films to join them at Denham. He was Executive in charge of productions with a splendid office on the first floor overlooking the entrance – pictured below. 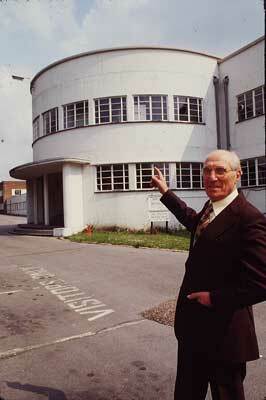 A very famous name in Denham Film Studio’s history is that of Herbert Smith – ABOVE. Herbert Smith, who was the brother of the late Sam Smith, founder of British Lion Films, was a well known figure in the British film industry with which he has been connected for many years. 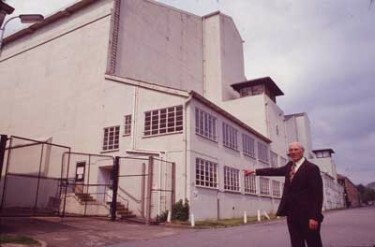 He continued to control productions at Denham till it closed in 1950. 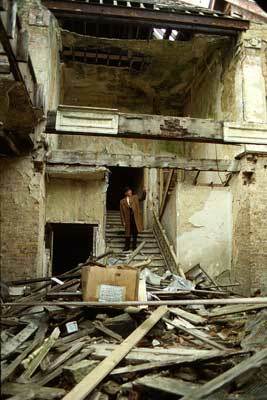 Pictures show Herbert Smith at his Old Office, Large Sound Stage, Grand Hall – now in ruins, and the Cutting Room. Interesting picture – above top left – of what was Alexander Korda’s office in the old mansion and see how close it is to the River Colne. I remember Michael Powell telling the story that he had attended a film story meeting for the film The Spy in Black in this very office at Denham – and present was Alexander Korda, the author of the book and another man who he had not met before but who had actually adapted the novel for the screen. 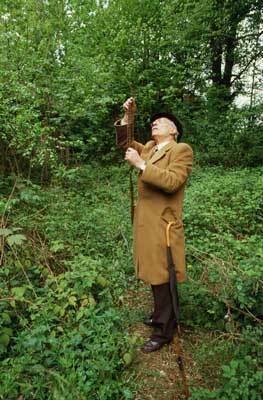 Michael Powell said that this man was asked to read out the bear bones of his story – which he proceeded to do. Michael said that he thought immediately that this man was a genius in the way he had adapted the story – he had, from the original, turned the story completely on its head – but it was good. That person turned out to be Emric Pressburger and thus began one of the most famous partnerships in film history – Powell and Pressburger. The two great men – above. Michael Powell and Emeric Pressburger were the most original filmmaking team in the history of British Cinema. The films that they made together under the name of their production company ‘The Archers’ include some of the most critically celebrated and best loved films ever made in Britain. Their work from the 40s, included – ‘The Life and Death of Colonel Blimp’, ‘A Canterbury Tale’, ‘I Know Where I’m Going’, ‘A Matter of Life and Death’, ‘Black Narcissus’, AND ‘The Red Shoes’. These would be good films by any standard and in any era. They were just so original in style. Kathleen Byron who starred as Sister Ruth in Black Narcissus above - from the novel by Rumer Godden – said that when Michael Powell offered her the role he said that it was a great part – but he added ‘make the most of it Kathleen because you will never get a part as good again’. And she said that he was quite right – she never did get as good a part as that again even though her career lasted for many years afterwards. Interesting little story I think.